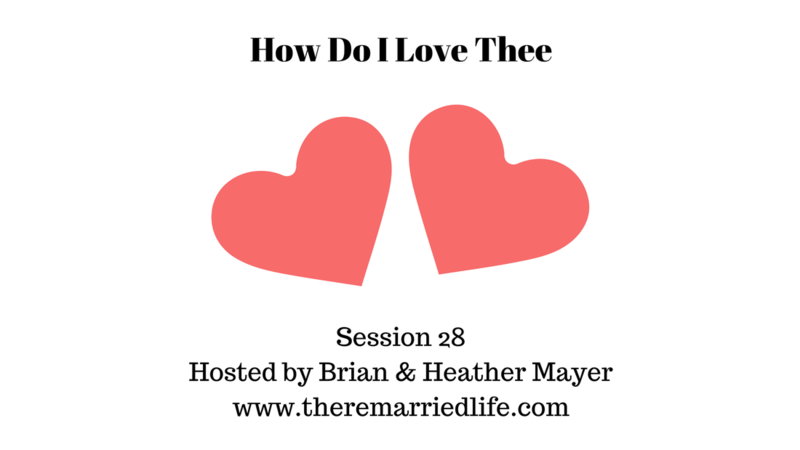 Todays’s Episode is inspired by the poem called “How Do I Love Thee?” by Elizabeth Barrett Browning. “How Do I Love Thee” was written by Elizabeth Barrett Browning as a dedication to her husband Robert Browning, who was also a poet. Robert basically rescued Elizabeth at age 40 from a reclusive and oppressive life under her father. Robert was so smitten with her poetry that he asked to meet and soon thereafter they fell in love through love letters. Wow what a love story! So with that as our inspiration let’s talk about some things in addition to writing poetry that can really show how much we love our spouse or partner. Leave a note in a lunchbox, on the steering wheel, or on the bathroom mirror. Text, “I Love You” or simply use Emoji’s. Share an Appreciation and Be Specific. For example, you are a wonderful teacher because I saw the way one of your students was struggling and how you stooped down on their level to console, comfort and encourage them. Wow! Give an out of the blue compliment. For example, “Thank you so much for cleaning the kitchen last night. I remember looking at it saying I’m so tired I’ll get to it tomorrow night. Thank you so much! Random hugging and kissing. Maybe you pass each other in the hallway at home and one of you grabs the other. Maybe you sneak up behind and give a peck on the neck. Whatever it is just find new and different ways to show affection. Holding hands when you are out together. Holding the door or other random gestures of kindess. Spur of the moment massages are always nice. Connecting through Listening to a marriage talk or sermon. When you hear something that affects one of both of you give a little squeeze or rub on the knee just to show you share in what you hear. Do the other person’s normal chore. Listen to Session 22 called Role Reversal in Remarriage for a more in depth talk on this issue. Send a card through the mail to work or home. Buy your partner their favorite treat. Give you partner the first 5 or 10 minutes of your time when you get home. We hope these ideas gives your relationship a bit of a kickstart and by all means get creative and come up with you own. In fact we would love to hear your creative ways that you do to show you love your partner or spouse. Post those in the Remarried Life Facebook group and please join if you have not.